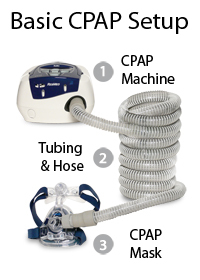 A basic CPAP setup consists of a CPAP machine, hose and CPAP mask. The CPAP machine and CPAP mask are attached to either side of the hose. The CPAP machine blows air into the hose and through the mask to you. Is APAP Really 'Better' than CPAP? If you are unsure about what part you need, view our part finder!